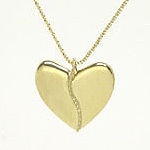 This solid 18k gold Harmony Heart pendant is accented with gold beads, forming a graceful S-shape along the front. The pendant is 7/8" wide. The Yellow Gold Harmony Heart pendant comes with a yellow gold wheat chain, echoing the sparkle down the center of the heart. The White Gold version comes with a white gold chain, with yellow gold accents. The chains are both 14k gold.